Samsung has officially announced the Galaxy S4 LTE-A Edition, the first phone to take advantage SK Telecom's newly launched LTE-Advanced Network. The new service will offer speeds up up to 150 Mbps, doubling the speed of the current 4G standard. The phone became public knowledge earlier last week thanks to leaks regarding the new new Snapdragon 800 processor. Yesterday also had a leak which showed the phone will come in both red and blue colors. Samsung co-CEO JK Shin announced the new phone at a press conference at Samsung headquarters in Suwon, South Korea, stating that the phone "could go on sale as early as this month in Korea." Shin confirmed that Samsung was in talks with several large overseas carriers to sell this new Galaxy S4 LTE-A phone, but given that most Western countries are still expanding their normal LTE networks, it might be some time before other countries can take full advantage of the phone. Seoul, Korea, 26 June 2013 – SK Telecom (NYSE: SKM) announced that it today launched the world's first LTE-Advanced (LTE-A) service through smartphones. The company achieved such a milestone in only less than two years after commercializing the nation's first LTE service in July 2011. LTE-A offers ultra-fast network speeds of up to 150 Mbps, which is two times faster than that of LTE, and 10 times faster than 3G network. For instance, LTE-A users can download an 800MB movie in just 43 seconds. With the commercialization of LTE-A, the company expects to further improve customer satisfaction in mobile Internet services, and increase the use of ultra fast video contents and other diverse mobile value added services. To commercialize LTE-A, SK Telecom successfully developed and applied the most-advanced mobile network technologies. The company already applied Carrier Aggregation (CA) and Coordinated Multi Point (CoMP), and plans to apply Enhanced Inter-Cell Interference Coordination (eICIC) in 2014. CA, commercialized for the first time in the world by SK Telecom, supports up to 150Mpbs speed by combining two 10 MHz components carriers to form an effective bandwidth of 20 MHz spectrum bands. With the surge of data traffic worldwide, CA will act as the key enabler for network evolution among mobile operators around the world. According to network experts, CA will be further advanced to realize up to 300Mbps speed by aggregating two 20MHz component carriers by 2015, and become capable of combining three component carriers by 2016. In addition, they expect to see the realization of uplink CA by 2016. The current CA standards allow for up to five 20 MHz carriers to be aggregated. Since launching the nation's first generation analogue network (1G) in 1984, SK Telecom led the popularization of mobile telecommunications service by commercializing CDMA (2G) for the first time in the world in 1996, and introduced video telephony service through the commercialization of CDMA2000 1X in 2000. In 2006, the company opened the era of mobile data communications service by commercializing the HSDPA technology over its 3G WCDMA network using a mobile phone for the first time in the world. Then, SK Telecom has launched the Korea's first 4G LTE in 2011 and successfully commercialized the Multi Carrier (MC) technology, for the first time in the world, in July 2012. SK Telecom announced that its existing LTE price plans will apply to the LTE-A service, meaning that customers will be able to enjoy twice faster network speeds without paying extra. The decision comes as part of its commitment to maximize customer benefits and satisfaction through innovative technologies and services. 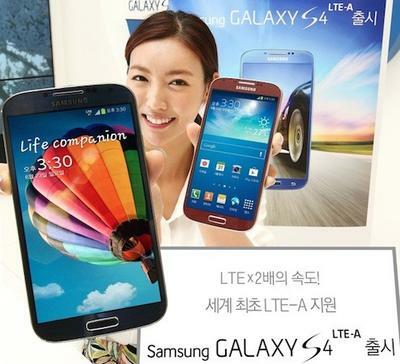 With the commercialization of the world's first LTE-A network, SK Telecom today released Samsung's 'Galaxy S4 LTE-A.' The Samsung device, the world's first phone optimized to work over LTE-A network, will come in two different colors, red (exclusively available at SK Telecom) and blue. SK Telecom will embed useful services like 'Safe Message' and 'Safe Data Backup' as basic features in all its LTE-A phones. Safe Message is designed to protect users from smishing (SMS phishing) attacks by enabling them to check whether the message is sent from a trusted source; and 'Safe Data Backup' enables users to upload personal data stored in their smartphones to the cloud server to keep data safe from smartphone loss and accidental deletion. The company also plans to mount these features on all its to-be released LTE phones as well. Customers can purchase Galaxy S4 LTE-A at SK Telecom's official online store named T World Shop (www.tworldshop.co.kr), or at one of 2,850 authorized SK Telecom T World retail stores. The company has secured an initial supply of 20,000 units of Galaxy S4 LTE-A. Furthermore, SK Telecom will vigorously expand its LTE-A phone lineup to boost the popularization of LTE-A service. It plans to provide a total of seven different LTE-A compatible smarphones in the second half of 2013. SK Telecom plans to expand its LTE-A coverage at an unmatched speed to keep offering the best call quality to customers. To achieve early commercialization of LTE-A, the company, for the first time in the world, developed the MC technology and applied it to its LTE network in July 2012. During the process, SK Telecom designed and built MC base stations in a way that they can support an optimized evolution towards LTE-A. In March, SK Telecom has launched aggressive plans to expand the coverage of MC base stations to 200 university areas and central areas of 84 cities nationwide. The company has built a total of 20,000 RU (Radio Units) as of June 2013. With MC in place, the company can easily evolve the network to LTE-A s through simple software upgrades. SK Telecom's LTE-A, launched today, covers the entire Seoul, central areas of 42 cities in Gyeonggi-do and Chungcheong-do, and 103 university areas. Furthermore, the company will gradually expand its LTE-A coverage to 84 cities across the nation. SK Telecom projects that, as mobile connectivity continues to gain importance, LTE-A will promote the development of ultra high quality video contents/services as well as a wide variety of new applications. On June 27, 2013, the company will launch a group video calling service for up to four users. The service, an upgraded version of the 3G network-based multi-party video conferencing service, will support 12 times better video quality and 2 times clearer audio quality. Moreover, SK Telecom plans to launch 'T Freemium 2.0,' a free multimedia content package that offers three times more contents – e.g. dramas, TV entertainment shows, music videos, sports game highlights, etc.- than its previous version, 'T Freemium,' in July 2013. The company is also planning to launch a new HD video-based shopping service in August 2013 to make shopping more fun and convenient for customers. Users will be able to seamlessly watch 6 different home shopping channels on one screen. Also, SK Telecom's online/mobile music portal service MelOn yesterday opened a new service category to allow users to listen to original CD quality music by downloading Free Lossless Audio Codec (FLAC) files. Meanwhile, SK Telecom will hold a large-scale contest named 'LTE-A i.con' to boost the creation and provision of diverse innovative contents and applications optimized for the LTE-A network. At today's LTE-A press conference held at SK T-Tower, SK Telecom's head office, the company demonstrated the speed of its LTE-A network by comparing it with those of LTE and 3G. It also showcased innovative LTE-A-based mobile value added services including MelOn's FLAC files, 'T Baseball Multiview' and Btv mobile's full HD video streaming service. Moreover, Kwon Hyok-sang, Head of Network Division of SK Telecom, made live video calls from SK T-Tower to Gangnam Station and the company's Daejeon office to show LTE-A's ultra-fast speed. Park In-sik, President of Network Business Operations at SK Telecom said, "SK Telecom is proud to announce the world's first commercialization of LTE-A. By supporting twice faster speeds than LTE, LTE-A will not only enhance customers' satisfaction in network quality, but also give birth to new mobile value added services that can bring innovative changes to our customers' lives."